Kid Stuff in Cripple Creek! 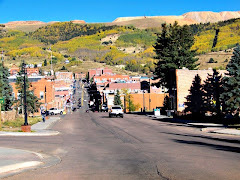 One of the MOST common complaints I hear constantly about Cripple Creek is "There is nothing for kids to do in Cripple Creek". This blog will attempt to help families decide if that is true or not! For every kid, there is something to do. I grew up in the country side, with NOTHIN' available to entertain ME! I have a very hard time understanding why folks complain about NOTHING TO DO IN CRIPPLE CREEK. What more could one want? You can walk down the streets safely, go to the parks, get ANYWHERE via the City Shuttle service, hit a swingset, people watch, pet donkeys........and that is just in town! So, keep an eye here! I will be digging round to find out what kids can do here in the Creek, besides the mineralogy, (rock collecting) plant collecting birdwatching donkey identifying or how about helping some old folks sweep their sidewalks or weed their garden? NOTHIN for Kids to DO in Cripple Creek!